Seed starting indoors is not for the timid or faint of heart. It’s an endeavor. Although it can potentially make economic sense to seed start, you’re saving some $$ in exchange for your time, commitment and literal weeding out. Yup, you must kill some of your seedlings that you have committed to. The experts call this “thinning out.” And I feel like this is a must-know before starting. If you’re cool with playing Darwin, then let’s proceed to some tips that will help you save time and give you a better chance at success. 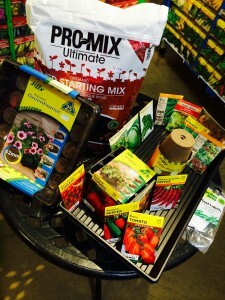 Seed starting soil–vital for seed starting success. 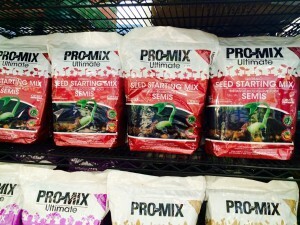 retain moisture without compacting. And it must do this in tiny pots or trays (and they must have drainage holes!). Seed starting potting soil is most widely used because it contains perlite which is a naturally occurring material (volcano popcorn!) which is lightweight and won’t compact. Coir, naturally occurring extract from coconut husks, is recommended by expert Jodi Kushins from Over the Fence Farm (a local CSA). What is key about both of these types of “soil” is that neither contain fertilizers. You’ll want to be able to control the amount and source of fertilizer later, once you have sprouts. Bottom Watering. When I mentioned commitment earlier it was in reference to watering. If you do not spritz daily with a spray bottle your seeds will not germinate and you’ve already lost. If you are able to keep on task and spritz those little seeds into germination you’ll see sprouts pop up within one to two weeks. Once you have sprouts, congratulate yourself and reward yourself by bottom watering. Bottom watering, in this case, is using a tray under your tray/pots (that have drainage holes) of seedlings that is filled with water. You can also add in your liquid fertilizer to the water you fill the bottom tray with. The soil will soak up the water and stay moist as needed and encourage root growth. Also key to winning. 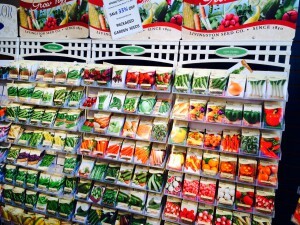 Oakland offers a huge variety of regular, heirloom, and organic seeds. Acclimation. At first I thought I was being very Darwinian when I took my first tray of seedlings and planted them directly into the garden. I figured after all the TLC I had given them indoors they needed to venture out on their own. Those that would survive were the toughest, right? The lesson, as always, is I’m a fool. Acclimation is the dance that needs to happen between your seedlings and the great outdoors. This is not some funny tradition, but completely necessary. Your little dudes have been growing in ideal, unrealistic conditions with lots of fake light, regular water, and no breeze. 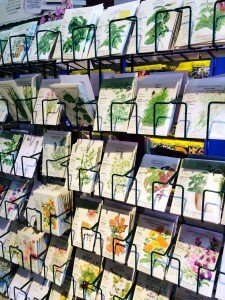 It will take about a week to two weeks for your seedlings to adjust to the outdoors (and grow a protective cuticle). Set out your trays/pots, in the shade at first, for a couple hours a day and then gradually have them out longer with a little direct sunlight. Bring them inside each night. After five to seven days of this back and forth, they’ll be ready to spend the night outside. After their first overnight, they’ll be ready for the garden! Okay, so there are really 4 must-know tips. Light! It, too, is really important for success. Little seedlings like loads of light, about ten hours a day. Use fluorescents directly over your seed trays, starting at about 4 inches. 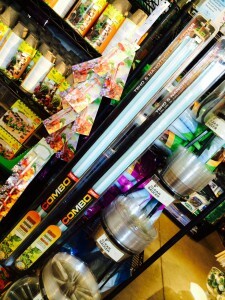 Once your sprouts begin to grow, you can move your lights higher. It’s important to keep your lights weirdly close to your seedlings so that they don’t over stretch (and pull a muscle…no that’s not right) and get leggy. Okay, maybe I was kinda right about the muscle thing. Regular fluorescents are fine if you’re unsure of your commitment and investment. If you want to get serious it’s worth it to invest in real grow lights. For a more step by step process, click here. 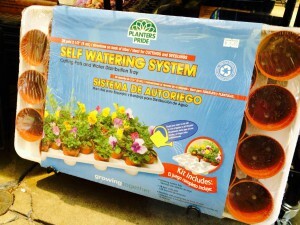 This entry was posted in Gardening and tagged gardening, seed starting, seeds, vegetables. Bookmark the permalink.